For milling purposes today at Bear’s Mill, the hard wheat is purchased from North Dakota, the corn is from Shelby, Indiana, and the wheat is from local areas in Ohio. Bear’s Mill in Darke County is on the National Register of Historic Places. DARKE COUNTY – For those lucky enough to attend this rustic mill, they will be welcomed by the black walnut siding that adorns this four-story structure. Upon entering, the sweet aroma of crisply brewed coffee and the freshly ground grains envelop everyone who walks through the door. A smiling face, such as Connie or any other volunteer of “The Friends of Bear’s Mill,” is sure to welcome all visitors. The gift shop is filled with local hand-made products and home goods that will transport guests back to a simpler time of the early 1800s. 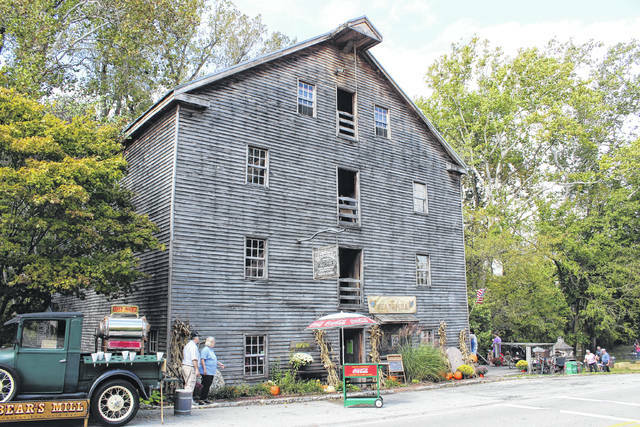 Bear’s Mill is an extraordinary mill that is well deserving of its place among the National Register of Historic Places. This remarkable mill serves as a reminder of Darke County’s rich history, it is an enticing tourist attraction for many families, and it serves as an example of the importance of preserving unique and historical places. In today’s society, there is a tendency to constantly improve and replace the things of the past in order to increase efficiency and quantity. Bear’s Mill, however, still operates as a working mill with the same simplistic design that was established when the mill was opened in 1849. The timber frame building is completely original, using the same belts, pulleys and grinding stones that were set in place more than 150 years ago. As shown on timelines in the mill, Gabriel Baer built the mill, located at 6450 Arcanum-Bear’s Mill Road near Greenville, in 1849. 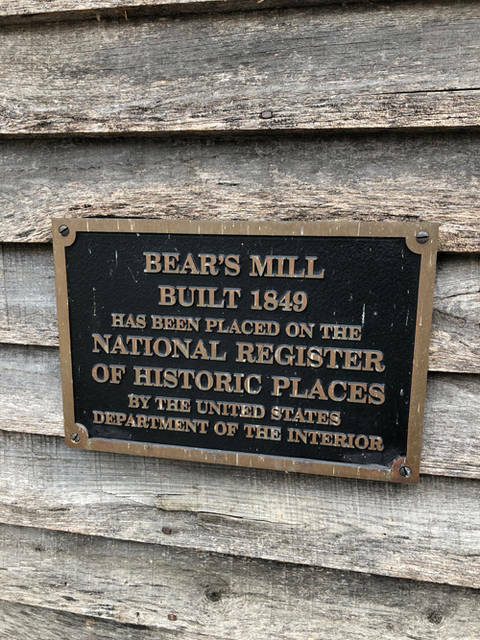 Curiously, the name “Bear’s Mill” was taken from Gabriel Baer, the original owner, only somehow the spelling had been changed over the years. Story has it that Baer went on a two-year journey to France in order to find the perfect grinding stones, called buhr stones, to mill all of the grains that were to be produced. These stones were harder than regular field stones, requiring the miller to sharpen them once every three months, rather than twice a week like other mills using less than ideal grinding stones. For this reason alone, Bear’s Mill stood as the leader in producing the finest milled products along a traveler’s journey as they made their way westward. For milling purposes today, the hard wheat is purchased from North Dakota, the corn is from Shelby, Indiana, and the wheat is from local areas in Ohio. When the creaky, black walnut front door to the mill is opened, one of the first things that will grasp the visitor’s attention is the world map that is hung on the wall. This map has pinpoints all around the world that showcase where people have traveled from in order to visit the mill. Even though it may be a surprise that they traveled this far to a small town in Ohio, there is no question as to why they decided to come. Bear’s Mill was the first of its kind in the Darke County area. Bear’s Mill has a shop and a museum that highlights many of Darke County’s local artists and history. Not only is the gift shop draped with local art displays, but fresh coffee grounds, grain that is milled right on their property, baked goods and different flavors of jams can be found too. Many exhibits that relate to the local history of Darke County can be found throughout the mill. Bear’s Mill hosts various activities throughout the year, such as a Christmas light nature walk and numerous art expos. Self-guided tours, or organized tours with a tour guide, are a must have for all guests. For obvious reasons, the certificate hanging by the door that recognizes Bear’s Mill for the standout tourism award from the website ohiotraveler.com is a well-deserved honor. The squeaking of the antiquated belts running through the supports of the mill allow guests to experience exactly what it would feel like to be hard at work grinding away at the buhr stones. This type of hands-on experience does more than just conjure fond memories of a simpler time. Without proper preservation, future generations would be unable to learn and experience these kinds of places anywhere other than a textbook. Preservation is crucial in order to keep historical places running. Bear’s Mill is one of the best examples of how preservation saved a historical place to benefit all of the future generations to come. The entirety of the mill’s framework is all original. When history is preserved, new visitors are able to learn first-hand and experience what that place was like when it was built. Let’s face it, reading about history in a textbook pales in comparison to actually being able to immerse oneself in history by actually visiting these transformative locations. Bear’s Mill is extraordinary for obvious reasons. The mill continues to remind people of Darke County’s rich history, it is a destination frequented by people from all around the world, and the mill shows that hard work and determination to preserve historical places pays off in the long run.